Sun-kissed beaches like Cascais and Sagres offer enticements of a more hedonistic sort. Indeed, the dramatic, end-of-the-world cliffs, wild dune-covered beaches, protected coves and long, sandy islands of Portugal's coastline have long enchanted visitors and locals alike. Flights to Portugal operate from varying airports and direct flights to Portugal are desirable and are mainly departing for the Algarve, Faro Airport, as it is the most popular with tourists looking for sun, sand and sea. Cheap flights to Portugal, Spain’s little sister – similar but completely different at the same time, this beautiful country has so much to offer the discerning traveller. With 6 stunning regions to visit, it will have you coming back time and time again. The most famous holiday destination in Portugal is the coastal region of Algarve and there are a number of islands to explore off the west coast. Due to the popularity, especially during the summer months, you’ll need to snap up the cheap seats before the prices of flights to Portugal sky rocket. 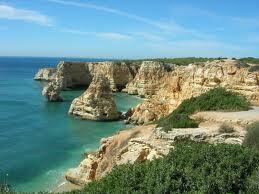 Therefore, try to book your cheap flights to Portugal well in advance to visit this incredible beach location. Most people book cheap flights to Portugal to discover the country’s fascinating history and is known to be one of the oldest countries in Europe, so history buffs you are in for a treat. Old ruins of villages and tombs can be seen scattered across the landscape and has been dated back to the Palaeolithic era. Thus it is imperative that you get out of the city and venture back in time as you visit monumental UNESCO Heritage sites, many of which are in Lisboa Regiâo such as the town of Sintra, the Torre de Belem and Mosteiro dos Jeronimos. Hopping on to a flight to Portugal will mean you can see all these fantastic sights and much more, such as the many influences and relics from Portugal’s exploration days when they discovered treasures in the islands, Africa and the Americas opening up trade routes. Booking a cheap flight to Portugal can also give you more cash to splash on shopping, dining, nightlife or even a room upgrade at your hotel. Searching for your cheap flight to Portugal is really easy, click any of the links for flights to the airport you want to fly to or use our flight search box. Directflights.com list all the cheapest flights to Portugal as well as all the cheapest direct flight to Portugal. After that you can plan the rest of your holiday – where to go, what to eat and when, here are a few pointers. Art plays a huge part in Portugal’s traditional architecture with many a fantastically and beautifully painted church all over the country as well as being evident in the various crafts, the Portuguese Catholic faith is a prominent inspiration. There are also a number of festivals that occur throughout the year and they are a colourful expression of Portuguese culture – well worth a look. There are loads to choose from such as Holy Week, Sanjoaninas, Trophy of Portugal (Sailing) and Boom Festival which celebrates art, freedom and nature. Book a cheap Portugal flight in advance to get the best prices, and then enjoy your sunny holiday. Southern Portugal, including the Algarve, has a Mediterranean climate with hot, dry summers and mild winters. Summer temperatures are high, but moderated by sea breezes. In the north the weather is wetter, particularly in winter, and cooler, temperatures influenced by Atlantic currents and the Spanish Meseta. The best time to travel to Portugal is during spring and autumn when days are pleasantly sunny and warm but tourist areas are relatively quiet.